Paris is burning, but my pain grillé isn’t, so that’s OK. Something is in the air. Perhaps it’s because the city just got 20 minutes nearer on the Eurostar, maybe it is the bracing slap of brilliant, winter sunshine in the streets of the French capital. Yet Paris has never looked more alluring, nor the restaurants so inviting. This is despite the current tensions and political unrest, which will remind many of the rough and tumble of the Thatcher years at home. Apt enough, as S and I whisk past the British Embassy in the Rue d’Anjou, the place where Mrs T once stood on the steps and faced political oblivion, although she didn’t realise it at the time. That was 17 years ago, although it seems like ancient history now. In the same street, the headless bodies of Louis XV1 and Marie Antoinette were buried in lime coffins after their brush with the guillotine. In a city full of seductions, the fact that every rue and avenue twitches with dark secrets remains one of Paris’s most captivating traits. Over the river and down into Montparnasse we pass another burial ground - the famous cemetery where Simone de Beauvoir, Samuel Beckett and, yes, even Kiki are buried – en route to a fish restaurant called Le Duc on Boulevard Raspail. 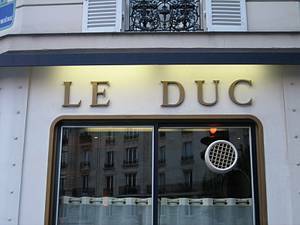 On its handsome corner site, Le Duc looks like the kind of prosperous, bourgeois restaurant that’s never had an identity crisis or a bad night. A nod to its nautical character is made with café curtains made of thick sailcloth stamped with brass eyelets, and a handsome brass porthole gleaming in the front door. On the cold street outside, the restaurant’s voiturier blows on his hands and stamps his feet to keep warm. Inside is rather like being in a cosy, wood panelled schooner, albeit one decorated with an army of lacquered turtle shells which have mounted a takeover on the walls. Is it the real turtle coup, or merely the mock? There is no time to wonder for tonight – and I suspect every night - the place is packed and it is time to take our seat. There is a bar to the right, where customers eat, drink and smoke – so shocking! - and a restaurant area to the left that seats around 30. Le Duc may be many things, but huge it is not. The delicious smell of roasting shellfish wafts through the cosy room, while a sad-faced waiter pushes a battered, ancient sweet trolley across the floor. As it creaks past, with its booty of rum babas, crème caramels and a fresh pear and almond tart, my instant carbon dating kit reveals that this was the very trolley that Marie Antoinette once selected her bon bons from. You don’t believe me? 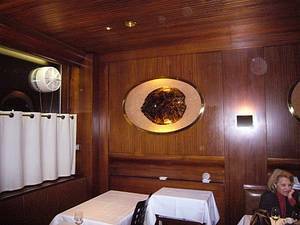 Would you settle for President Mitterrand, who really did eat here whenever he could? The leather banquettes in the main room are as plump and deep as the ocean, and give a pleasing wheeze when you sit on them – or perhaps that was just me – while the bar features fabulous, bright orange barstools of a strictly Sixties vintage. Here, old French hommes smoke cigars the size of sausages and mutter in gravelly voices to their wives, while bar staff crash bottles of expensive burgundy into hillocks of ice. We sit at the bar, and are furnished with baskets of excellent baguette, a dish of winkles and two pins, plus a generous pat of Normandy butter with Le Duc stamped on its creamy surface and a menu. There are some specials listed, including details of the daily 46-euro lunch menu, with two choices in each course, but this is clearly the kind of place that rolls out the classics and old favourites to a devoted clientele. One of the most popular dishes seems to be lobster with farfalle pasta, served in silver dishes for two to share, which whizzes out of the kitchen on a regular basis. There are palourdes cooked with thyme and cream; fresh langoustines with ginger; soupe de poisson; assortments of smoked fish; scallops; monkfish with olive oil and lime; sea bass steamed with seaweed; encornets (small squids) with garlic; John Dory served with vodka butter, stacks of prime oysters and – the holy grail for S and me – lots and lots of wild fish, cooked simply. We begin with a mighty crab salad anointed with a lemon dressing which a waiter pours from a glass jug. It is simple, but perfect. Elsewhere, nothing is done without drama. Belon oysters the size of saucers are served on silver platters piled high with seaweed and ice, and a stack of whelks for good measure. They don’t fare particularly well against the meaty bivalves, which S proclaims the best he has ever had. We share a grilled turbot for our main course, a perfect piece of fish filleted at lightning speed on a hunk of wood that perhaps doubles up as an anchor tie. It is prettily served with the fillets split between the two plates and a fish cheek placed on each. This is served with nutty, black rice from the Camargue and pods of caramelised endive. There is no choice. This is what you are given because this is what the chef had worked out will work best with his superb seafood. And it does. The fish is excellent, the sparse, elegant accompaniments perfectly pitched. No wonder dedicated gourmand Mitterrand was a regular at le Duc, lunching on the restorative powers of oysters before visiting his three mistresses in the afternoon; the women he called his starter, main course and dessert. We sit next to a wealthy Belgian businessman, in his navy blazer and thick silk shirt, who says he believes this to be the best fish restaurant in northern Europe. That is a bold claim, although it is certainly one of the best we have ever eaten in, with a quality of produce which, I am afraid to say, is almost impossible to find in comparable London restaurants. Not that there are any in the first place. In the teak cosiness of Le Duc, as the waiters in tailored grey waistcoats glide between tables with their trays of shellfish and beautifully cooked fish dishes, I am already plotting my return. 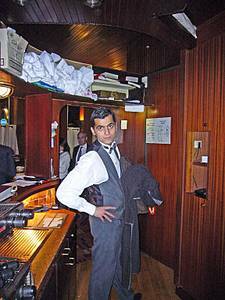 Le Duc, 243 Bld Raspail 75014 Paris. Tel: 01 43 20 96 30. Dinner for two, 250 euros.